Jeff Weintraub: Better & worse forms of economic "stimulus"
In some ways, admittedly, the idea that governments should respond to economic downturns with policies of fiscal "austerity"—that is, with spending cuts and other measures to reduce their growing deficits—may seem like common sense. To quote one popular but misleading slogan, when individuals and families have to tighten their belts, government should tighten its belt too. And before the 1930s, this piece of economic folklore would also have been regarded as sound and responsible mainstream economics. Unfortunately, life is sometimes more complicated than that. Ever since the Great Depression of the 1930s and the work of John Maynard Keynes it has been recognized—or, at least, it should be generally recognized—that this is precisely the wrong way to respond to an economic crash. In that kind of situation, a fixation on government deficit-cutting is not just misplaced and harmful but systematically counterproductive and self-defeating. As the amount of demand in the overall economy slumps, withdrawing further demand from the economy through those "austerity" policies just accelerates a self-reinforcing contractionary spiral. Insufficient demand reduces sales and discourages investment, businesses cut back or go bust, unemployment increases and incomes shrink, consumers have less money to spend, and so on ... with the result that the economy declines even further or, at best, remains stuck at a depressed level where it is operating well below capacity. A shrinking economy also yields smaller government revenues from taxes, increasing government deficits, and for governments to try to improve that situation with spending cuts and/or tax increases will reinforce contractionary tendencies in the economy. In the meantime, there is a lot of unnecessary suffering and social disruption. Some key implications are pretty clear. To put it bluntly, when the economy is threatened by or recovering from a major recession, the government should be running a deficit (except in exceptional situations that make this difficult or dangerous) to pump more demand into the system, offset contractionary dynamics, and help promote economic recovery. In the US case, for various reasons, the major responsibility for doing this rests with the federal government, not state and local governments. (And, by the way, if you've been hoodwinked by right-wing propaganda into believing that the Obama administration's 2009 economic "stimulus" didn't work, thus disproving Keynes on this point, think again.) More generally, fiscal policy should be counter-cyclical. Everything else being equal, governments should bring down their deficits in good times, not bad times. The time for governments to balance the budget, run surpluses, or pay down the debt is when the economy is booming. During downswings in the business cycle, let alone major economic crises, trying to do those things is a bad idea. It is now almost five years since the beginning of the financial crisis in 2008, which triggered the big economic crash of 2008-2009 from which we are still struggling to recover. Different economic policies have been followed in different countries—more Keynesian in the US, despite unrelenting Republican sabotage and obstructionism, though not Keynesian enough ... and more anti-Keynesian in Europe, most notably in Britain. Well, the results are in – Keynes was right, contractionary economics was wrong, but the damage is done. 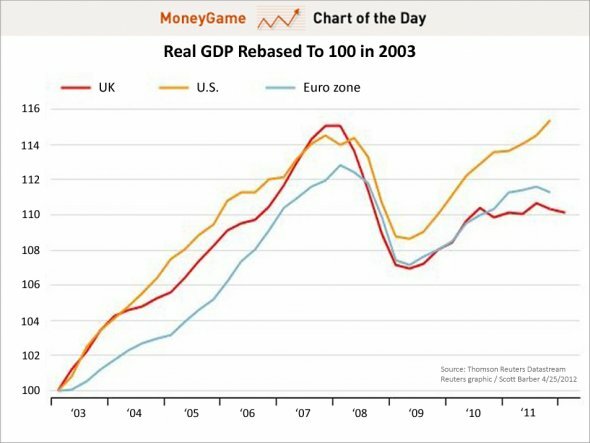 If you want a quick comparison of life with and without economic "stimulus", just check the graph at the beginning of this post. As you examine that graph, bear in mind that the kinds of policies favored by the Republicans and the right-wing propaganda apparatus (including, for example, the Wall Street Journal editorial page) generate the red and blue lines, as opposed to the yellow line. With respect to the continued sluggishness of the economic recovery in the US, part of the blame lies with the excessive timidity and caution of the Obama administration and the Congressional Democrats in 2009, when there was still a filibuster-proof Democratic majority in the Senate (though the 2009 economic "stimulus" did, at least, help keep the economy from going over the edge into another Great Depression). But fundamentally, in this context as in so many others, the Republicans are the problem—not the only problem, admittedly, but a crucial and dangerous problem—and any discussions of economic policy, unemployment, and the slow pace of recovery from the Great Recession that try to evade or obscure this central reality are not worth taking seriously. => Once one faces the fact that counter-cyclical fiscal policies are a necessary part of responding to severe economic slumps, in order to pump needed "stimulus" into the economy, one then has to consider what kinds of economic stimulus are most effective in promoting economic recovery and reducing unemployment. As Jonathan Chait recently reminded us, back in 2010 Dylan Matthews took the trouble to lay out some relevant comparisons, based on various estimates by solidly mainstream economic analysts. As one might expect, the forms of economic "stimulus" most favored by Republicans, then and since, are among the least effective in terms of promoting economic recovery and reducing unemployment—though, to be fair, they are among the most effective in terms of increasing after-tax income for the wealthy and helping increase overall economic inequality. On the other hand, the forms of stimulus most effective in terms of promoting economic recovery and reducing unemployment (look down toward the bottom of the chart below) have been fought tooth-and-nail by the Republicans. What conclusions should one draw? We report, you decide. P.S. By the way, "increased infrastructure spending" to start rebuilding, repairing, updating, and otherwise strengthening our national infrastructure would not only employ a lot of people and help stimulate economic recovery, but would also make excellent sense in terms of long-term public investment. Even Peggy Noonan can see that—though she doesn't seem to have noticed that her party has relentlessly blocked this, too. We can get a better picture of the overall effectiveness of a stimulus method by looking at its contribution to GDP. The most recent numbers come from April's Senate testimony (PDF) from Mark Zandi of Moody's. Zandi calculated the change in GDP caused by a dollar spent on various stimulus policies. Here are the results, grouped from least effective to most effective. You might want to click [here] to see the larger, and more readable, version. Did Syria ruin the "Arab Spring"?